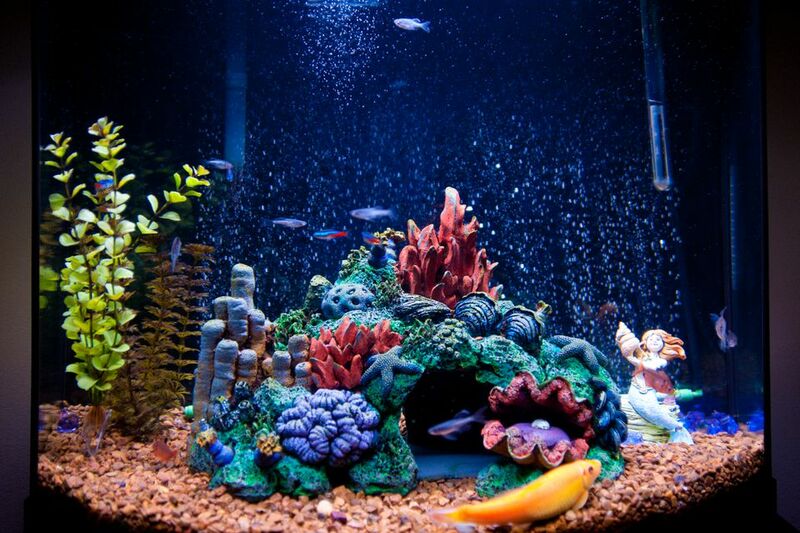 Saltwater aquarium lighting requirements are different for different types of tanks. FO (Fish Only) tanks require the least lighting. For the most part, lighting for a fish-only tank is for your enjoyment of the fish in the tank. A vast majority of fish and invertebrates (crabs, hermit crabs, and shrimps) don't really require much light at all for them to go about their lives. "Fish-only tank lighting" describes what you will need for these tanks. Most aquarium kits (include tank, filter, and lights) include lighting that is more than sufficient for a fish-only tank. Many of these kits now include lighting that is actually suitable for reef tanks with soft corals. The top mini/nano aquariums include kits that have adequate lighting for fish-only and better tanks. FOWLR (Fish Only With Live Rock) aquariums have a higher lighting requirement because some of the tank occupants need a certain amount of light in order to function. Macroalgae is a good example of something that will need light in order to grow properly. Most saltwater aquarists strive to have a good crop of coralline algae growing in their tanks. The different colors of the coralline algae not only add color to the tank, but they make the tank look more like the ocean. Coralline algae growth is almost entirely dependent on the light you supply to it. While fluorescent lighting will work well for most FOWLR tanks, with the cost of very efficient LED tank lights plummeting, you might want to take a look at some of the earlier LED units. These will meet your needs and save a little money in the process. Reef tanks with corals, fish, anemones, and other invertebrates have the highest lighting requirements for your reef tank. Different corals have different lighting requirements. Some of the soft corals, such as mushrooms and zoanthids have relatively low light requirements compared to some of the hard (LPS & SPS) corals, which demand a much higher light intensity in order to grow and reproduce. Back when the only viable choice for growing corals was a lot of fluorescent lights hanging over a tank, along came the power compact (PC) fluorescent lights, which produced a lot more light in a smaller fixture. Then metal halides came in vogue as "the only light for growing corals." This thought promptly went by the wayside when it was discovered that LED's (Light Emitting Diodes) could be created, which fulfilled the lighting requirements (intensity and proper spectrum) of corals and at the same time were much more efficient than fluorescents or even metal halides. No matter which type of tank (FO, FOWLR or reef) you are putting together, try to plan for the future when purchasing tank lighting. Purchasing a higher grade of lighting than you really need right now may pay off with saved money in the future when you (and you will) eventually upgrade to a reef tank. Is It Time to Go to LED Lighting on Your Reef Tank?